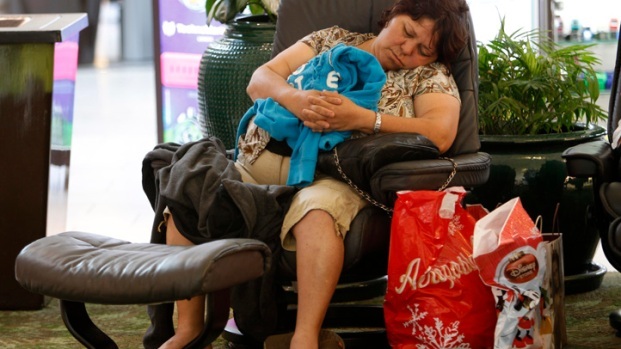 Black Friday shopping can be hazardous to your health. One woman apparently used a stun gun on another after an all-out brawl inside of the Franklin Mills Mall in Northeast Philadelphia. Mike Napolitano was in the mall with two of his friends when they came up on the fight. "It started out, one couple was fighting with another couple. They had words, the guys got into a fight and then the girls," said Napolitano, who videotaped the melee. "One couple, they were like a family and all, with a young child in a stroller." A all-out brawl erupted during Black Friday shopping at the Franklin Mills Mall early Friday morning. Police believe a stun-gun was used during the fight. An alert NBC10 viewer pulled out his cellphone and captured the whole thing on video. NBC10's Nefertiti Jaquez talked to the man who shot that video, as well as police who say they've launched an investigation. The video shows the two women punching each other and someone in the crowd yelling, "No, stop." After the two hit the ground, fighting, you can hear the crackle of what sounds like a stun gun and see fluorescent-colored sparks. "One girl just brought out a taser," the 20-year-old said. At that point, several people run up and pry the two women apart. "Then security came over and I kinda left, you know, I was thinking, 'God forbid if somebody has a gun or something,'" Napolitano said. Mall security confirmed that a fight did break out in the mall around 2:30 a.m. In a statement to NBC10, mall general manager John Ahle said security acted quickly to take control of the situation. "An isolated incident occurred in the early morning hours between two female shoppers, that was quickly stopped by our security team, and both women were escorted out of the mall," he said in the statement. "We are committed to the safety of our shoppers, retailers and employees and will not tolerate this unacceptable behavior"
The mall opened at midnight on Black Friday is remaining open for 18 hours. NBC10 was there prior to the opening and dozens of shoppers were already lined up outside, ready to take advantage of the day's deals. Crime data from Philadelphia Police shows 39 assaults took place at The Franklin Mills mall in 2012. That's up from 32 in 2011. Robberies also jumped from seven to 19 over the two year span. However, the data also shows there was a drop in shoplifting incidents from 287 in 2011 to 265 the next year. Vehicle thefts and thefts of property from inside vehicles were also down. The stun gun brawl wasn't the only fight during the holiday shopping kickoff. There were a number of incidents nationwide that resulted in injuries and arrests. Police in Garfield, N.J. had to pepper spray a Wal-Mart shopper who was fighting with another man over a television. In Southern California, a police officer was injured during a fight outside a Wal-Mart there. And a dispute over a parking spot outside a Virginia Wal-Mart led to one man pulling out a handgun. He was then stabbed in the arm.